*Please note: This post was written in May of last year, and I am only just now sharing it. Please enjoy! This week’s sewing challenge was actually made last Saturday. For those of you who don’t know, my current job has me working crazy early in the morning, which causes me to wake up moderately early on the weekends. So crazy sleep schedule combined with pre-show jitters combined into the opportunity to make this shirt. In case you were unable to attend Ye Olde Yellow Cabaret – May, the show was amazing. There will be another one in August so you can see what I’m talking about. I have a variety of men’s dress shirts that are too big on me and too small for my husband. 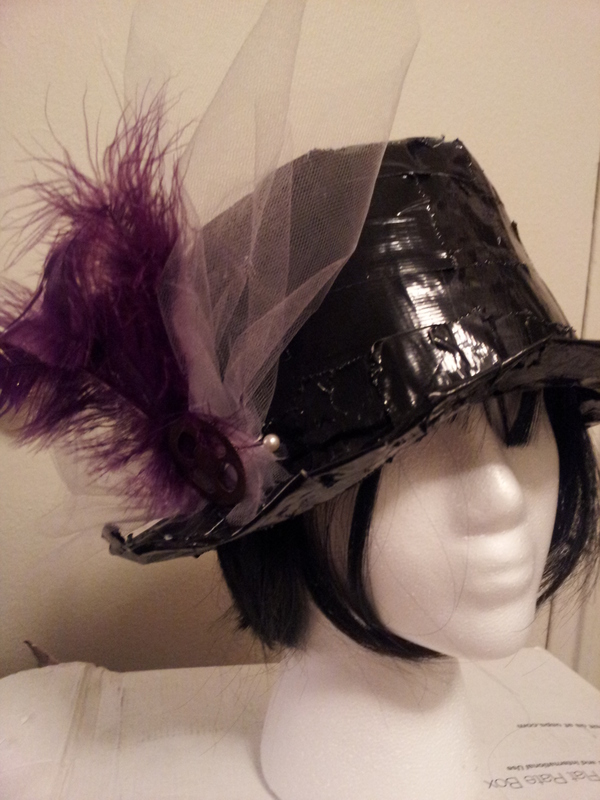 I have been trying to figure out the best way to modify them for steampunk and costuming purposes. For this one, I decided to try out a modification that I have tried on a different shirt previously. Threadbanger had posted this (http://youtu.be/hvopk72Bx3Y) video awhile back and I was able to recreate the modification with pretty decent success. I say pretty decent because the neckline is uneven and kind of poorly done. I’m not sure that it is especially noticeable, but it bothers me because I know that it is wrong. This time around I made sure to be more careful about how I cut out the neckline so it would not be so uneven from one side to the other. Then I went to turn the fabric down to create a channel for the ribbon to go through. Things were going pretty well until they weren’t. I got a cup of coffee and thought things over. I then found some scrap fabric and created a long tube for the ribbon to go through. I sewed the tube down at the top and bottom so it would be secure. After that was finished I ran the ribbon through. Since I wasn’t sure if it would work or not, I just left the opening on one side and did not have a place for the ribbon to come through on both shoulders. Please note that I did not have to make a tube, I just needed to sew a long rectangle down. I guess the coffee had not kicked in yet. Purple and green are the colors of my airship! So there you have it. A shirt that I made from having watched an internet video over a year ago or more. There are a couple of videos where they show how to modify clothes to make them more steampunk, as well as multiple costume tutorials. I highly recommend them, as well as any other videos that they show. They are very crafty people. 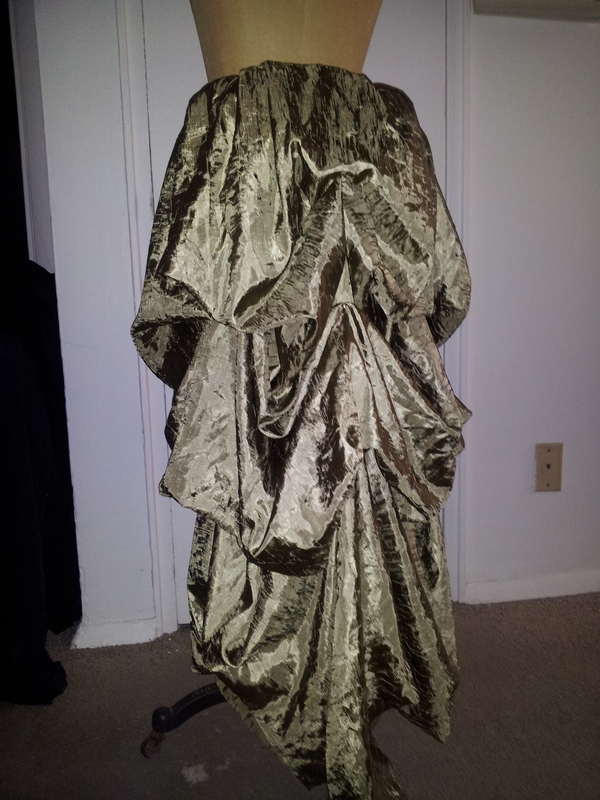 Total Cost: $10 – $5 for the curtain, $5 for the safety pins and twill tape at the panel. Some time ago I attended a steampunk convention where Jessica of Ties that Bynde had a panel on how to create a bustle using a yard of fabric, some twill tape and some safety pins. Kits with or without fabric were for sale for anyone who wanted to learn how to create a simple bustle but did not bring materials with them. 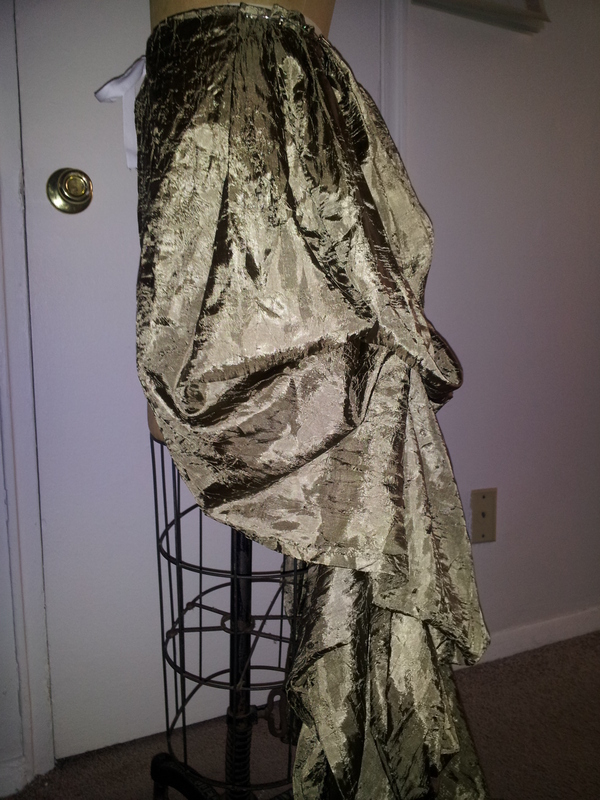 I picked up this curtain for the purpose of making something steampunk related. I love the light green color and how the fabric drapes. I also like that it is not meant to be a smooth fabric and I do not have to worry about ironing it. I do not like how reflective it is when a flash is used. The creation of the bustle is very simple. Twill tape is pinned to a piece of fabric that is pleated to fit the wearer at the waist (or where you want the bustle to sit). More pleats mean less coverage but a fuller looking bustle, less pleats mean more coverage but the fabric will be stretched out more and it will be harder to make the bustle look as full. 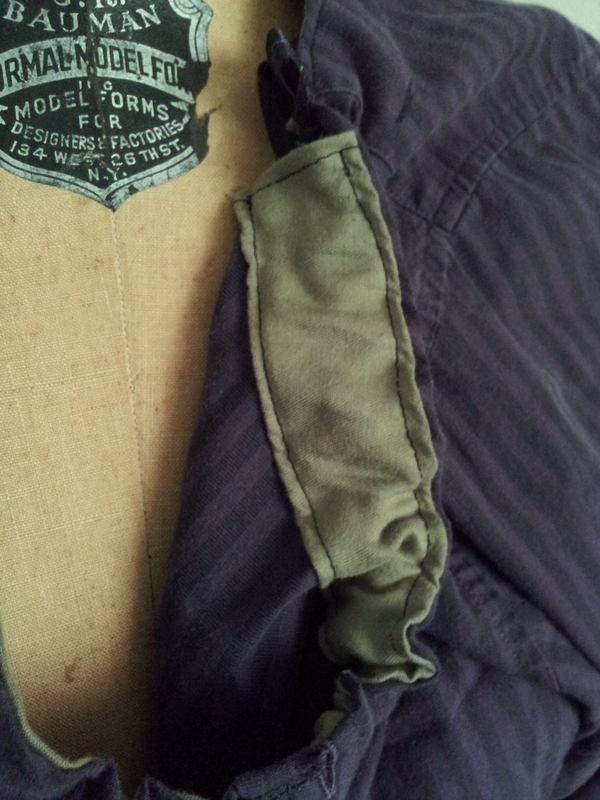 This first piece of twill tape is also serving as the waistband and needs to be long enough for this purpose. To this first piece of twill tape, attach 3 more pieces of twill tape, going vertically. 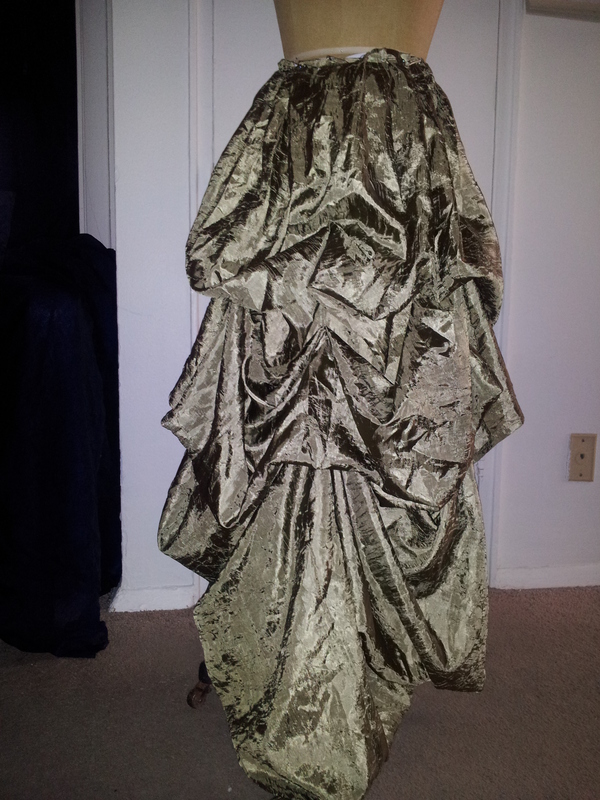 Then, play with draping. 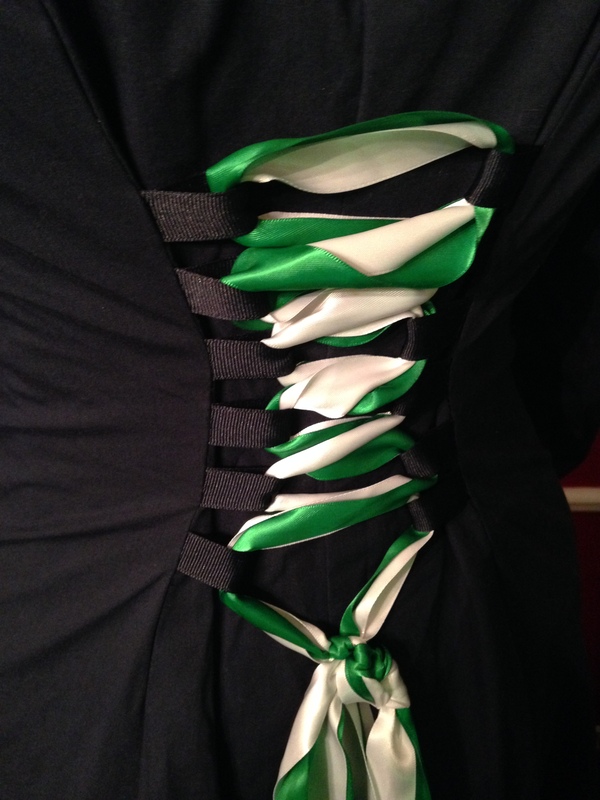 Pick a spot and pin the fabric of the bustle to the twill tape. Make it symmetrical. Make it asymetrical. Find what works for you. Since the fabric is being attached to the twill tape with safety pins it can be changed for future wearings. Personally, I am going to play around with the bustle draping a little bit more and then I am going to sew the fabric down to the twill tape to create a permanent bustle. The pictures above show the bustle with a bustle pad. 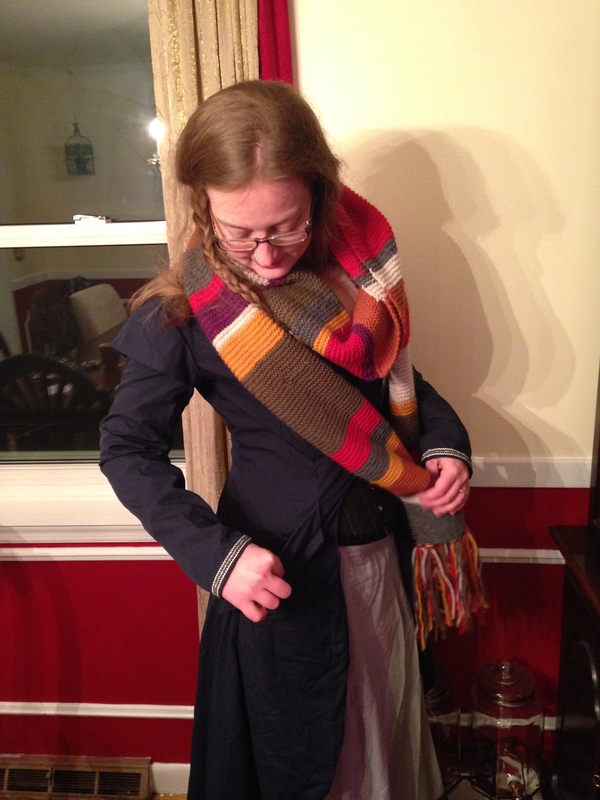 I also took picture without the bustle pad as I have not yet incorporated a bustle pad into my steampunk outfits. Here is what the bustle looks like without the bustle pad. Notions: Lace, crochet, beads, baubles, scrapbook paper, vintage frames, new frames, found items, previous projects, etc. Time to complete: Many hours of cleaning, searching, placing, fighting, rearranging, putting together, taking apart, and doing everything all over again. Still a work in progress. Total Cost: Since the buttons, ribbon for lacing and trim were from stash, and the fabric was less than $5, the whole jacket probably cost me less than $10 in materials. I made this jacket with one of the Steampunk patterns that I have seen at every Steampunk convention that I have been to. I modified it a bit. The sleeves seemed a bit short to me, so I added some length. I originally wanted to make the sleeves removable like they are shown here: http://www.pattern-file.com/archives-2011/pattern-reviews/thar-she-be-pirate-bridesmaid-costume-from-simplicity-2172/ , but I decided against it as this was my first time with this pattern. I did decide to do a different collar since I do not really want the version that they show on the envelope. The versions that I have seen with the ruffle do look nice, but I don’t think that it is really for me. I used the collar pattern from the men’s costume pattern Simplicity 4923 and modified it to where I thought it would work. It didn’t really turn out like I expected it to. I really thought that it would stand up, or lay flat, but it folds over. I hand stitched the ribbon trim around the collar and sleeves. I then used ribbon for the back laces in colors that matched the trim to pull the details together. I’m pretty pleased with this overall. Eventually I would like to make the bodice included in this pattern, but I doubt that I will ever make the skirt as shown on the envelope. I do not want to bother with all of those pleats. Speaking of skirts, the skirt that I am wearing is one that I made. When I saw this sheet (yes, I have a lot of thrifted sheets that I will be using for sewing) I thought that the color stripe would make a really neat design detail at the bottom of a skirt. I used some pattern pieces that I had used previously as templates and guessed at the width that I would need at the waist. I ended up with 4 gores (from a 6 gore skirt) because the fabric was not wide enough to have 6 with the stripe. I considered making it 6 gores and have 3 with the stripe and 3 without, but I decided against it. My goal was really to have a solid design detail at the bottom of the skirt. I botched the waistband and the zipper horribly, but once I pair this with a corset and the Simplicity 2172 jacket, both are covered and no one can tell, except for me. Sorry, but I don’t have any good pictures that show the skirt bottom. Detail of the lacing in the back. This was the first time that I worked with a pattern that added laces. I am rather proud of how they turned out. Sorry about all of the wrinkles. I didn’t iron this after it was washed. I should probably do that before my next convention.